This chart shows differences in bacteria counts in wet weather from 1987 - 2007. Lower bacteria counts are preferable. Lighter blue areas indicate areas with lower bacteria counts. Deer Island's final treated effluent has met or surpassed all secondary treatment numerical limits in its NPDES permit. Since 1989, Enterococcus bacteria counts in the Charles River have been reduced dramatically. The Clean Water Act requires a permit for wastewater or industrial treatment plants to discharge to receiving waters. MWRA’s current National Pollutant Discharge Elimination System (“NPDES”) does not include a numerical flow limit at which blending can occur nor does it require that any specified level of flow receive secondary treatment. 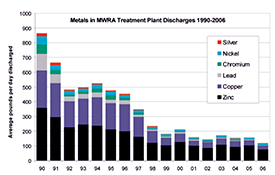 Metals in MWRA treatment plant to Boston Harbor and Mass. 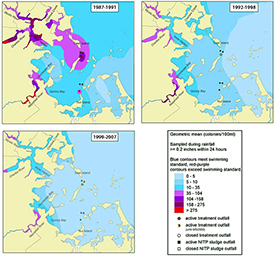 Bay have declined by more than 80%. 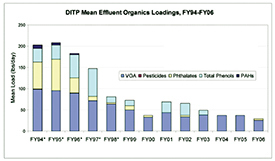 There has been a long-term decrease in discharges of organic chemical pollutants. 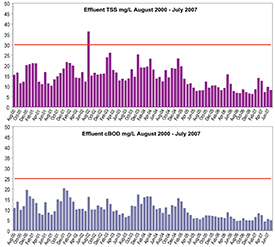 This may be due to: (1) MWRA's aggressive pretreatment program and stricter enforcement; and (2) the treatment plant's more efficient operation. It was only a little over 20 years ago that Boston Harbor was known as the “dirtiest harbor in America.” Today, it’s a" Great American Jewel". The $3.8 billion invested in the treatment facilities at Deer Island have proven to be a great success and the harbor clean-up is widely recognized as one of the nation’s greatest environmental achievements. For over one hundred years, the disposal of the daily waste of Boston and its surrounding communities got only limited treatment before being dumped right into the harbor. Today, that treatment is state-of-the art and the flows - which meet stringent state and federal standards - are transported 9.5 miles out into the deeper waters of Massachusetts Bay. Recent significant changes to the treatment plant’s infrastructure have resulted in a more microbiologically stable secondary process, permitting higher flows through the secondary process. These changes include the decommissioning of the sludge-thickening centrifuges at Deer Island once the sludge line to the pelletizing plant in Quincy became operational in 2005, modifications to the secondary clarifiers, and ongoing improvements to the oxygen generation system, which allow more efficient oxygenation in the secondary reactors. As a result of ongoing experiments, secondary capacity has gradually been increased. In addition, the MWRA is spending $850 million on combined sewer overflow (CSO) projects to protect beaches, shell fishing beds and other sensitive waters from overflows due to heavy rains. MWRA has also invested more than $30 million in specialized discharge and oceanographic monitoring and studies of water quality, sediment quality, and the health of marine species. The work, which is ongoing, has been exhaustively reviewed by regulatory agencies and an independent panel of scientists, presented at numerous public meetings, and published in peer-reviewed literature. More than 300 technical reports and more that 1,000 scientific papers on the subjects of Boston Harbor and Massachusetts Bay document environment conditions and changes since the new treatment facilities were brought on-line. No adverse effects attributable to the discharge have ever been found. Meanwhile, the beaches and ecosystem of Boston Harbor have rebounded. Secondary wastewater treatment is a complicated biological process that was brought on-line in stages. As these facilities were brought on-line, MWRA continually made operating adjustments and performed retrofits to optimize plant performance. PDF files on this site require Adobe Acrobat Reader® (free download).